You are here: Home>Archive>First World War Collection>WW1 Medals and ribbons awarded to Harold Godwin>World War One 1914-1915 Star awarded to 4th Class Artificer Harold Godwin. 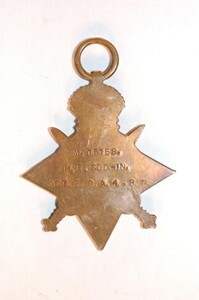 World War One 1914-1915 Star awarded to 4th Class Artificer Harold Godwin. 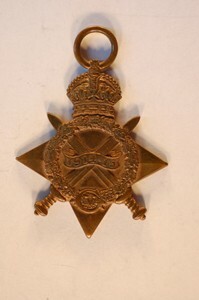 The medal is a four pointed star of bright bronze, ensigned with a crown, with a height of 50mm, and a maximum width of 45mm. The obverse has two crossed gladii (swords) with blades upwards and a wreath of oak leaves, with the Royal Cypher of King George V at the foot and an overlaying central scroll inscribed “1914-15”. The reverse is plain with the recipient’s number ‘M.16188’, rank ‘ACT.E.R.A.4.R.N’ and name ‘H E GODWIN’. The ribbon is not attached to the medal.